The following words are from a scrapbook compiled by George A Robinson which is held at Essex Record Office. “My brother, Ernie, was a member of the Volunteer Fire Brigade for two years, when he emigrated to New Zealand and is still in residence there. I have tried to recall the names of as many of the original members of the Brigade as I can, but, of course, came up against a brick wall as each one I thought of, was dead. I have, however, managed to locate two who are still alive, and luckily, they are important ones, as they were among the members who got the Volunteer Fire Brigade off the ground. They are the Blake Brothers, William and Robert, (Bill and Bert), and in 1923 were in their late teens. Their Father, Frederick Blake was Chairman of South Benfleet Parish Council. Our nearest Fire Brigade at that time, was at Southend-on-Sea, some seven or eight miles away, so the two Blakes and some other young men, decided that we ought to have a Brigade of our own. I believe, a year or two later, a small Brigade came into being at Hadleigh. I have had a meeting with the Blake Brothers, as we talked over all we could remember. Regarding Mr. William Henry Shepherd, who was Captain of our Volunteer Fire Brigade, and whom I knew, I am afraid we did not gather much information. He was a fine looking, handsome man and looked a typical leader. He was married and had, at least, one Daughter, and lived at Thundersley, Essex. He was a Fireman and a Butcher, and was then Lincensee (sic) of three Public Houses – ‘The Weir’ Rayleigh, on the A127, London to Southend Road, then the ‘Queen’s Hotel’ Westcliff-on-Sea, and later, ‘The Ship’, Rochford, all in Essex. The Blakes thought that he must have died in the late 1930’s. Now, to return to the Volunteer Fire Brigade. In 1923 Mr. Frederick Blake put the suggestion to S. Benfleet Parish Ciuncil,(sic), with a request that they would support and finance it, but the Council turned it down. However, not to be beaten, Mr. Shepherd and the Blakes enlisted other young men and Mr. Shepherd contacted Mr. Percy Garon, who, I think, was Chief Fire Officer at Southend. (the Garon family practically ran Southend in those days, with various Food Businesses, Restaurants and being on various Committees, etc), who gave a great deal of help in training and obtaining equipment, mostly obtained through fund raising functions, Dances, Whist Drives, Fetes, etc. By then, they had obtained a Handcart and Hoses, and the Licensee at the ‘Anchor Inn’, S. Benfleet, Ted Land, allowed them to use one of his stables as a Headquarters. They then arranged a rota, wherein two members were on watch every night until mid-night. Mr. Land’s two sons, young Ted and George, were members of the new Brigade. Ted later becoming Driver when they were able to afford an Engine, about eighteen months later. In the case of fire the ‘Anchor’ was contacted, when the Lands let off a maroon and the Volunteers got to Headquarters as quickly as possible! If the main body of firefighters had already left, the others would chase after the engine on cycles. (just as an aside, my Brother was such a heavy sleeper that the maroon never woke him in the night. My other Brother and I used to try to get him up, but he used to say we were “kidding”, so we always had to fetch Mother or Dad to assure him that the maroon had really gone off!). The community interest was so great, that when the maroon went off, inhabitants would stand at their gates, even late nights or early mornings, with watches in their hands, to see how quickly the lads turned out. Eventually, in about 1928, Mr. Frederick Blake persuaded the Parish Council to put a penny on the rates for the Fire Brigade. Mr. Albert Langraff, also a Councillor, offered them a portable garage, free if they would remove it, and old Ted Land, of the ‘Anchor’, allowed them to put it on the corner of his field in, what was then The Endway, (now Essex Way, where the Electricity Board’s Generating Station now stands). Mr. Langraff lived at the top of South View Road, which is about a mile and a half from the site in The Endway, so the Firemen knocked the floorboards out of the garage, all got inside, lifted it by the crossbeams, and walked it to its desired position!! They said it caused quite a stir to see a garage gliding along the road with no visible means of transport. I must mention that all roads, with the exception of the High Road, were unmade at that time, with just a muddy footpath and the road full of deep ruts. The Firemen then enlarged the Station themselves, by building another section the same size of the garage alongside. 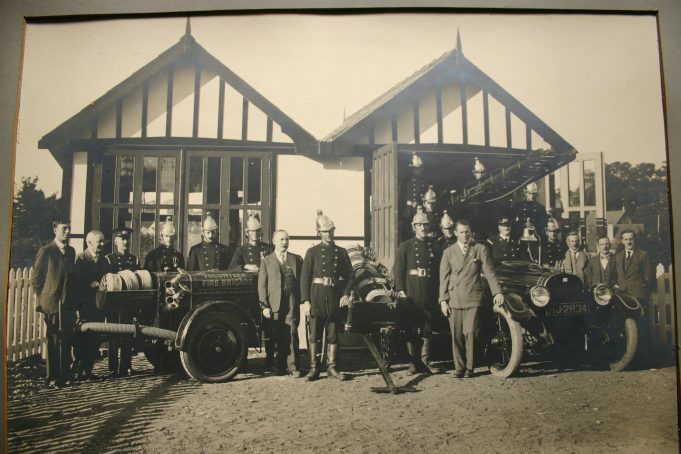 That was their Headquarters, until S. Benfleet, Thundersley and Hadleigh were converted into the ‘Benfleet Urban District Council’, when an official fire Brigade was formed and a Fire Station built at Hadleigh in 1931. Since the re-allocation of Districts, Canvey island is now included in Benfleet Urban District Council under the new name of ‘Castle Point District Council’ and there is another Fire Station on Canvey Island. The Blake Brothers have two framed photographs of the Brigade on their engine outside their new Headquarters in The Endway, in which Mr. Shepherd and the Blake Brothers are pictured. They also have a Medal, dated 1925, presented for winning the Handcart Competition against Southend Brigade”. The above article is undated, however, given the reference to ‘Castle Point District Council’ it must be post 1974.